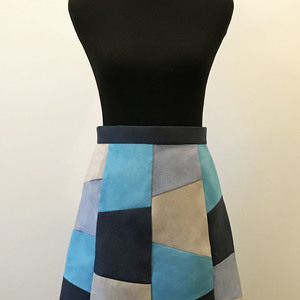 This skirt is a great introductory project for sewing with velvet. 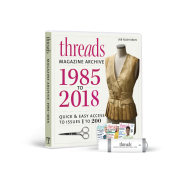 There are only two seams, and the fit is easy and adaptable: It works for 32-inch to 44-inch hips and 24-inch to 36-inch waist measurements. The waist-to-hip area is shaped with three rows of couched elastic cord, which creates a shirred effect in the velvet, an excellent way to emphasize the fabric’s texture. 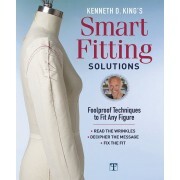 The waist is gathered until it approximates your waist measurement, then bound with extrawide double-fold binding. A zipper in the left side seam completes the closure and fit, and the hem is left raw-edged. One of the most important lessons from this project is to recognize and pay attention to velvet’s nap. Nap refers to velvet’s textured, fuzzy threads, which are arranged in one direction on the fabric. When brushed with the hand along the grain, it is rougher and darker in one direction, smoother and shinier in the other. You can use velvet in either direction for this project, as long as it is consistent on the garment’s front and back. The skirt front and back are the same size and shape. Each is a rectangle approximately 44 inches wide and 22 inches long. First, the front and back pieces are joined with a seam, creating a single skirt piece that is about 83 inches wide. 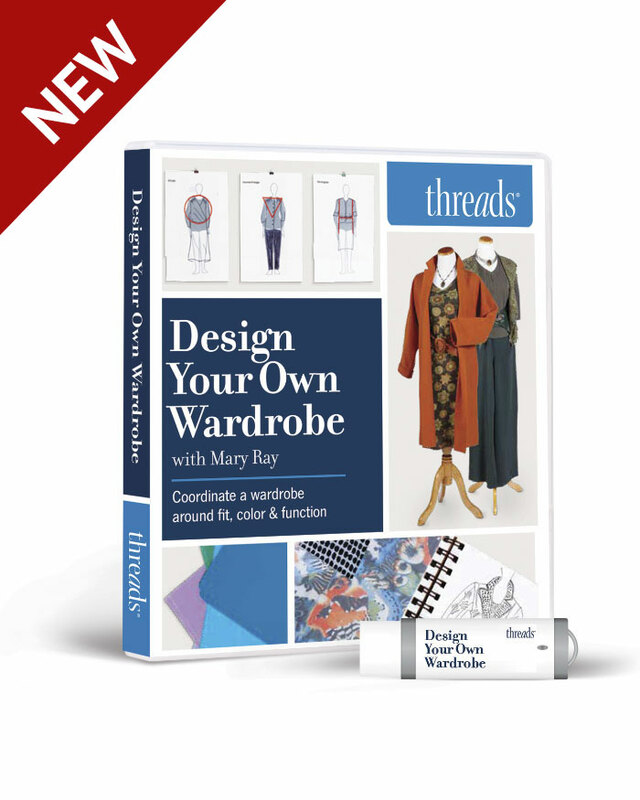 This very generous width is shirred to create fit and texture. 1. Cut or “rip” the skirt fabric. This skirt has a bound waistline and a raw-edged hem. 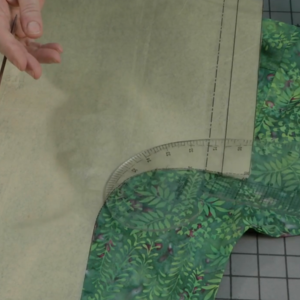 That means there is no waist seam allowance or hem allowance: The fabric length is also the finished skirt length. The sample skirt is 22 inches long. 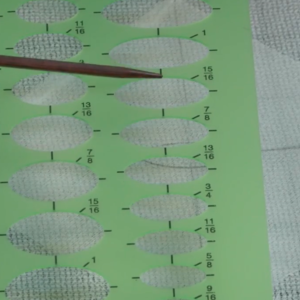 To cut: Lay the velvet yardage out flat. 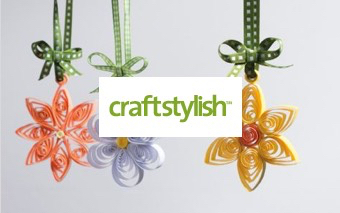 Use a rotary cutter to cut two 22-inch lengths, perpendicular to the selvage. 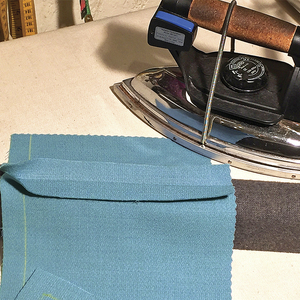 To rip: Snip perpendicular to and through the velvet’s selvage, at least 1 inch from the fabric’s cut end. 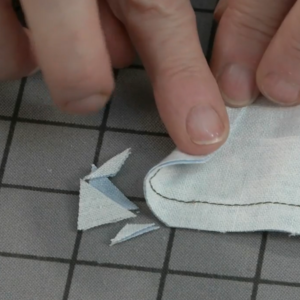 Grip the fabric on both sides of the snip firmly and rip across the fabric’s width. 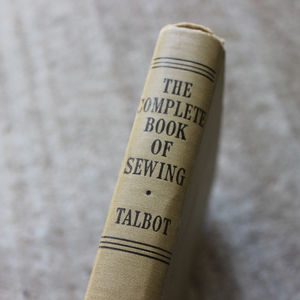 The rip should follow the weft across the fabric, straight and perpendicular to the selvages. Snip through the other selvage to separate the fabric pieces. Rip the fabric twice more to create two 22-inch-long pieces. 2. 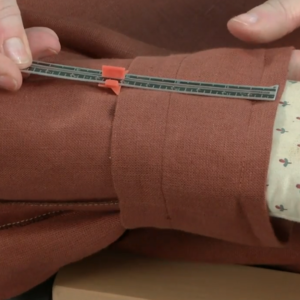 Trim the selvages. The velvet’s selvage is flat. Trim just within the velvet’s napped area, for two pieces approximately 42 inches wide and 22 inches long. 3. 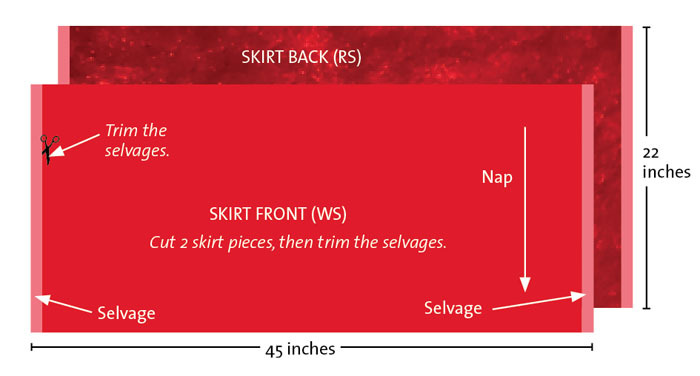 Arrange the skirt front and back for sewing. Check the velvet’s nap, and mark its direction on the fabric’s wrong side. Layer the pieces, with the nap consistent, right sides together and all edges aligned. Prepare one short edge/side seam for sewing; see “How to Sew Velvet Like a Pro,” for ideas to make the velvet stay in place as you sew. 4. 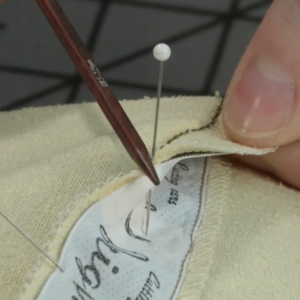 Sew the right side seam. Decrease the sewing machine tension, and position the velvet so you’re sewing in the nap’s smooth direction. 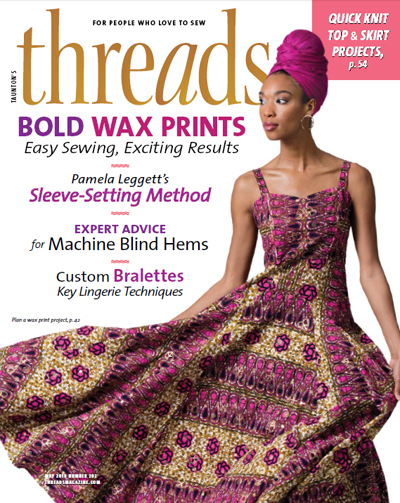 Use a walking, Teflon, or roller foot, and hold the velvet taut as you stitch with a 5/8-inch-wide seam allowance. 5. Press the seam allowances open. You should never touch an iron directly to velvet, as the fabric is easily and permanently marred. Instead, cover the ironing board with a lofty, evenly textured towel. Place the velvet right side down atop the towel, and use the iron to steam it from the wrong side, hovering over the fabric and never touching it directly. With one side seam sewn, the skirt front and back are a large rectangle. 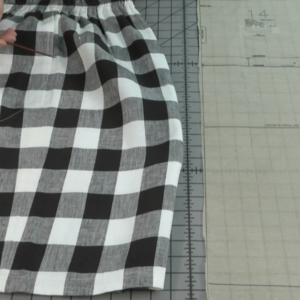 You’ll shape the skirt’s hip area with shirring: straight, parallel, and evenly spaced rows of gathering. The gathering effect on the fabric is achieved by running elastic cord through zigzag stitching channels. 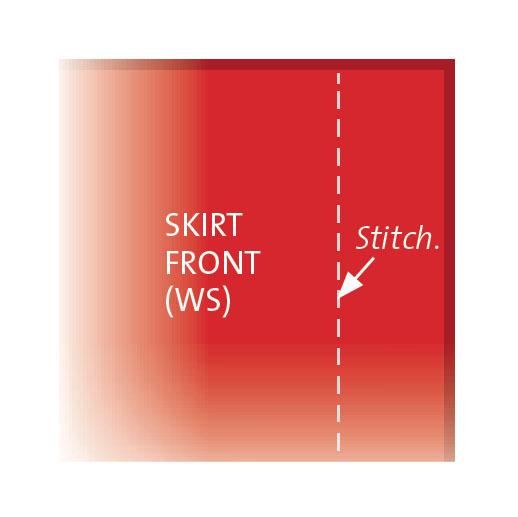 The skirt’s waist isn’t elastic; it is gathered and then bound to create a narrow waistband. 1. Prepare to sew channels for the elastic. Double-check the velvet nap, and choose the waist edge for your skirt. Three inches from and parallel to the waist edge, mark a line on the skirt’s wrong side. Repeat the marking for two more parallel lines, each 3 inches from the last. 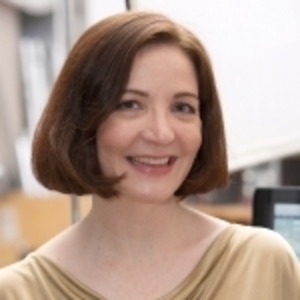 Alternatively, if your sewing machine has a quilting stitch guide, set it to 3 inches and plan to use it to guide your stitching. 2. 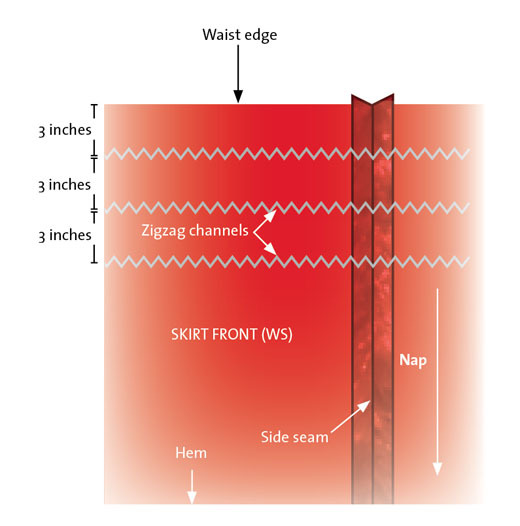 Sew zigzag shirring channels. 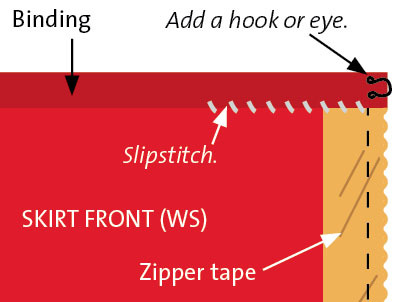 Set the zigzag stitch to 5 mm wide and 2 mm long, for a wide and dense thread channel. Follow the marked lines, or use your sewing machine’s quilting stitch guide to sew three rows of zigzag stitching. Putting in the elastic to shirr the skirt is the last construction step. It’s much easier to gather the waist and sew in the zipper before the velvet is shirred. After these details are completed, and the second side seam is sewn, you’ll shirr the skirt by drawing elastic through the zigzag channels. 1. 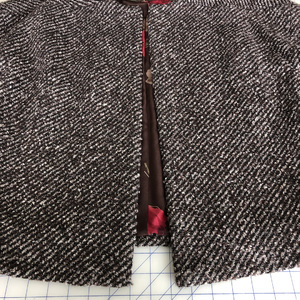 Add gathering stitches to fit the waist. Set the sewing machine to a basting stitch, and sew 1⁄4 inch, 3/8 inch, and 7/8 inch from the waist edge. Leave long thread tails at each end of each stitching row, and start and stop each stitching row 5/8 inch from the fabric’s end. 2. Add the zipper, and finish the left side seam. Follow the instructions packaged with the invisible zipper, or use this tutorial as a guide. Avoid the gathering stitches as you sew it in. 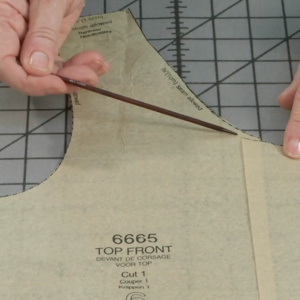 With right sides together, align the raw edges and finish the seam below the zipper. 3. Gather the waist edge. Tie the needle thread tails and the bobbin thread tails together at each end. Pull the tied bobbin threads firmly to gather the waist edge, until it is about 1 inch to 2 inches longer than your waist measurement. The gathering will be dense; be sure to distribute it evenly. Tie the bobbin tails again to hold the gathering. Baste through the gathering, about 1/2 inch from the waist edge, to keep the folds in place. 4. Bind the waist edge. Unfold one side of the binding and align the raw edge, right sides together, with the gathered waist edge. Leave 1/2 inch of binding free beyond the zipper opening. 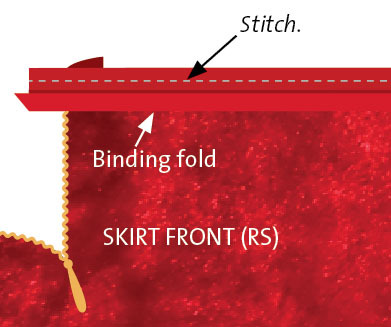 Stitch along the foldline, through binding and fabric. Trim the binding 1/2 inch beyond the opposite side of the zipper opening. 5. Hand-stitch to finish the waistband binding. With the skirt wrong side up, fold in the binding’s free ends. Press or tack in place. Then wrap the binding’s free folded edge to the wrong side, and slipstitch to the first binding stitching. 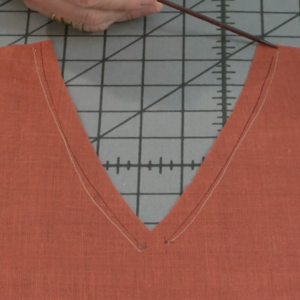 (Insiders can see a video on sewing a slipstitch here.) Sew a hook and eye to the binding ends. 6. Shirr the skirt. Turn the skirt wrong side out. Cut three lengths of elastic cord, each 4 inches longer than your hip measurement. The finished skirt has ease in the hip area for drape, and so that it won’t ride up toward your waist. Thread the blunt-tipped darning needle with one of the elastic cord lengths. Start at the zipper side seam, and carefully draw the needle and the cord beneath the zigzag stitches. Knot the cord’s end so that you don’t accidentally pull it too far. Circumnavigate the skirt with cord, and knot the cord next to the zipper. Hand-stitch the cord ends to the seam allowances on each side of the zipper. Repeat with the other two elastic cords and zigzag channels to finish shirring the skirt. 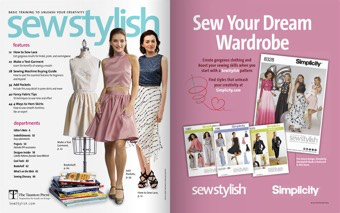 “Romantic Velvet Skirt,” by Sarah McFarland, was originally published in SewStylish, Fall 2014. Photo by Jack Deutsch and illustrations by Michelle Penney. 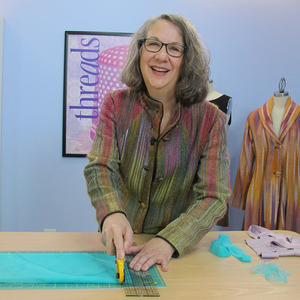 How do you keep the hem from raveling and dropping bits of the pile all over? Every type of velvet I've ever used raveled quite a bit. The velvet used here was well-behaved and didn't shed or ravel. I guess we were lucky! For tips on hemming velvet, go up to step 3 under "Cut the Skirt," and click the link to "How to Sew Velvet Like a Pro." There are some helpful techniques there.